World War I Chapter 31. 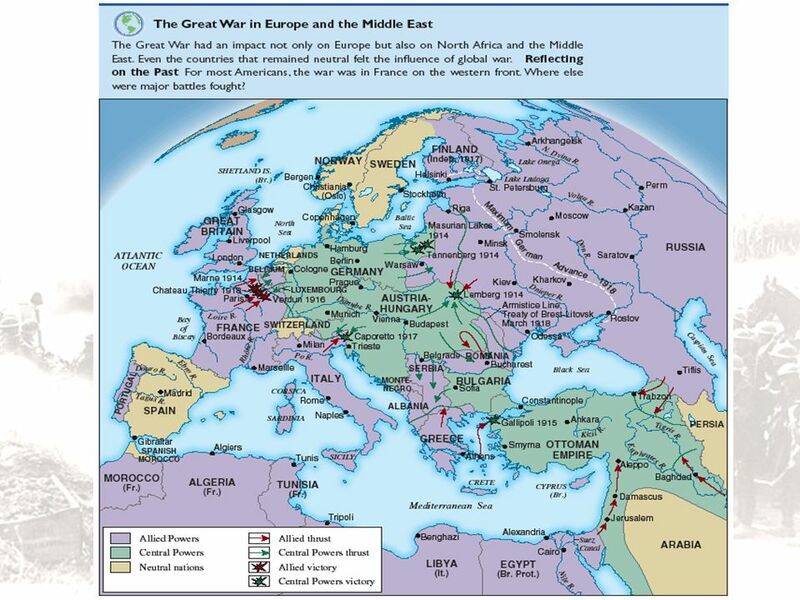 5 Stagnation in Europe The war in Europe had quickly ground into a stagnant mass slaughter on both sides. 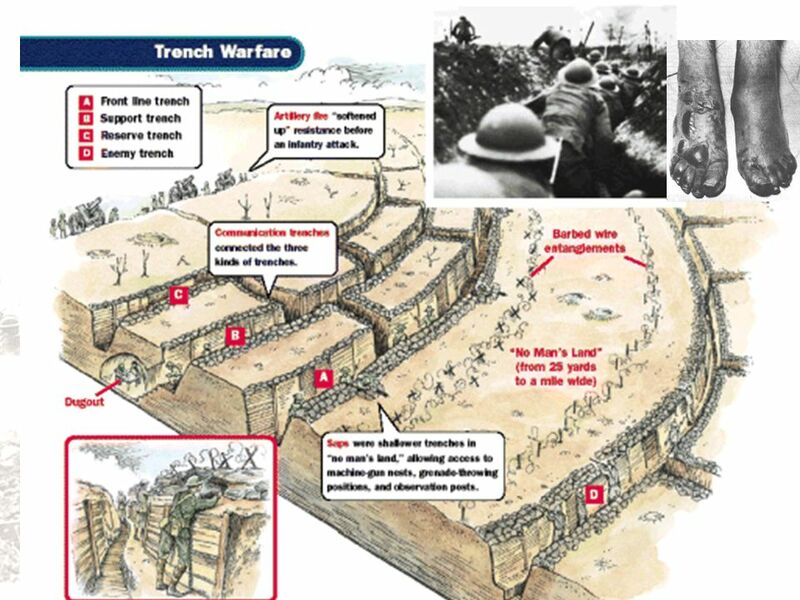 Trenches Stagnant lines. Casualties on both sides were extraordinarily high. Reasons. By early 1917 both sides were running out of steam. Germans couldn’t go on much longer simply throwing new bodies into the war. Britain was highly dependent on foreign shipping for keeping its war effort going. Germany needed to end the war soon or lose. 7 Unlimited Sub Warfare Peace without Victory address. 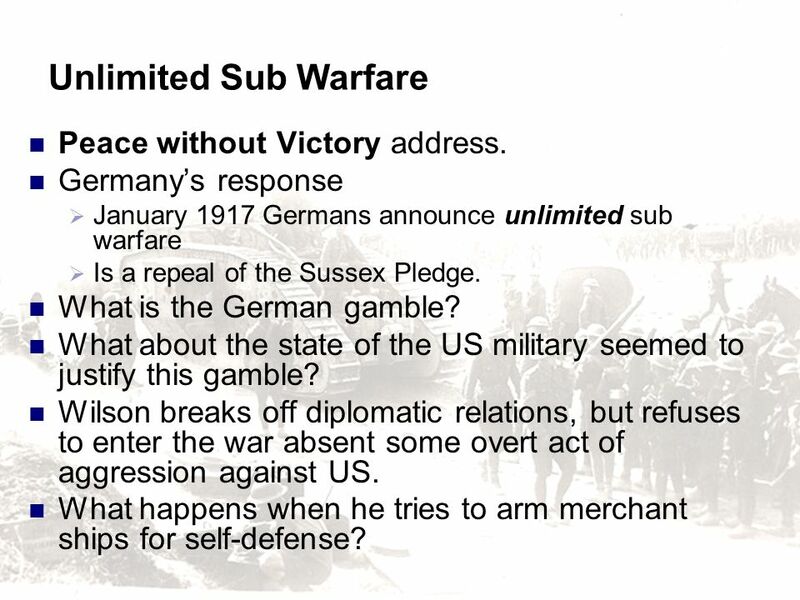 Germany’s response January 1917 Germans announce unlimited sub warfare Is a repeal of the Sussex Pledge. What is the German gamble? What about the state of the US military seemed to justify this gamble? Wilson breaks off diplomatic relations, but refuses to enter the war absent some overt act of aggression against US. What happens when he tries to arm merchant ships for self-defense? 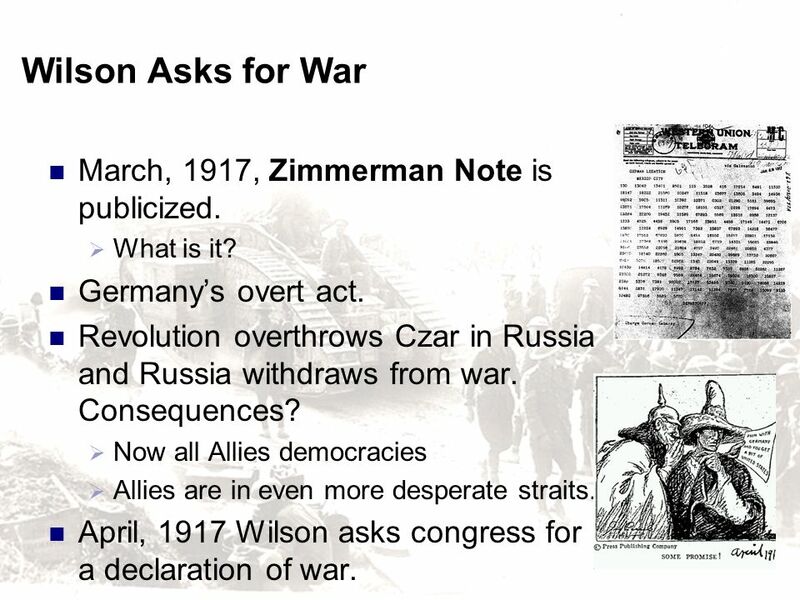 9 Wilson Asks for War March, 1917, Zimmerman Note is publicized. What is it? Germany’s overt act. Revolution overthrows Czar in Russia and Russia withdraws from war. Consequences? Now all Allies democracies Allies are in even more desperate straits. April, 1917 Wilson asks congress for a declaration of war. The Zimmermann Telegram (or Zimmermann Note; German: Zimmermann-Depesche; Spanish: Telegrama Zimmermann) was a coded telegram dispatched by the Foreign Secretary of the German Empire, Arthur Zimmermann, on January 16, 1917, to the German ambassador in Washington, Johann von Bernstorff, at the height of World War I. On January 19, Bernstorff, per Zimmermann's request, forwarded the Telegram to the German ambassador in Mexico, Heinrich von Eckardt. Zimmermann sent the Telegram in anticipation of the resumption of unrestricted submarine warfare by the German Empire on February 1, an act which German High Command feared would draw the neutral United States into war on the side of the Allies. The Telegram instructed Ambassador Eckardt that if the United States appeared likely to enter the war he was to approach the Mexican government with a proposal for military alliance. He was to offer Mexico material aid in the reclamation of territory lost during the Mexican-American War, specifically the American states of Texas, New Mexico, and Arizona. Eckardt was also instructed to urge Mexico to help broker an alliance between Germany and Japan. The Zimmermann Telegram was intercepted and decoded by the British cryptographers of Room 40. The revelation of its contents in the American press on March 1 caused public outrage that contributed to the United States' declaration of war against Germany and its allies on April 6. Isolationism ran deeply in the American psyche. Washington’s farewell address While most favored the Allies, the fever to go to war was relatively mild. 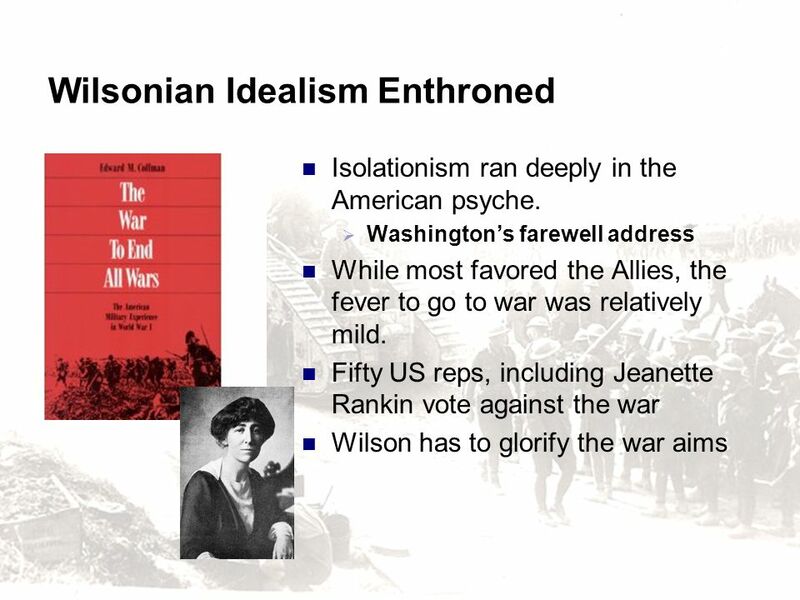 Fifty US reps, including Jeanette Rankin vote against the war Wilson has to glorify the war aims 2. Five reasons why Wilson asked for a Declaration of war a. Most important: Unrestricted submarine warfare; U.S. no longer able to protect its ships -- Wanted to preserve trade to Allied markets. b. Zimmerman Note c. Russian Revolution in March 1917 created more acceptable Russian democracy than a Czarist regime as an ally. d. U.S. could end war quickly and insure itself a major role in ensuing peace. e. Moral reason: Germ. mass-killing of civilians; Br. harassment of U.S. ships endurable 3. Later myth emerged that U.S. munitions manufacturers and Wall Street bankers had lured the U.S. into war in order to make handsome profits. (Nye Committee in 1930s) -- In reality, they were already making huge profits unhampered by wartime gov’t restrictions and heavy taxation. 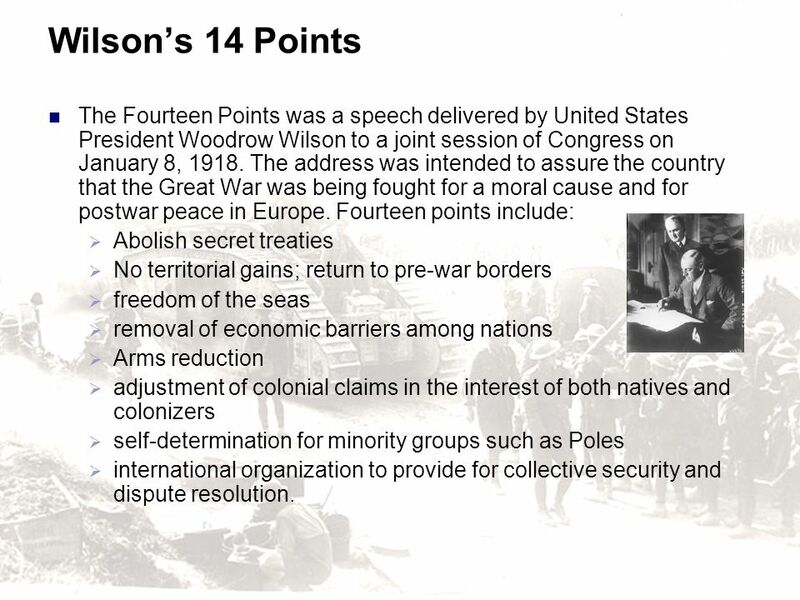 11 Wilson’s 14 Points The Fourteen Points was a speech delivered by United States President Woodrow Wilson to a joint session of Congress on January 8, The address was intended to assure the country that the Great War was being fought for a moral cause and for postwar peace in Europe. Fourteen points include: Abolish secret treaties No territorial gains; return to pre-war borders freedom of the seas removal of economic barriers among nations Arms reduction adjustment of colonial claims in the interest of both natives and colonizers self-determination for minority groups such as Poles international organization to provide for collective security and dispute resolution. The Fourteen Points was a speech delivered by United States President Woodrow Wilson to a joint session of Congress on January 8, The address was intended to assure the country that the Great War was being fought for a moral cause and for postwar peace in Europe. People in Europe generally welcomed Wilson's intervention, but his Allied colleagues (Georges Clemenceau, David Lloyd George and Vittorio Emanuele Orlando) were skeptical of the applicability of Wilsonian idealism. The speech was delivered 10 months before the Armistice with Germany and became the basis for the terms of the German surrender, as negotiated at the Paris Peace Conference in The Treaty of Versailles had little to do with the Fourteen Points and was never ratified by the U.S. Senate. Colonel Edward M. House was a Colonel for the United States Army. He worked to secure the acceptance of the Fourteen Points by Entente Leaders. Sir William Wiseman was the Chief of British Intelligence in House and Wiseman worked together through World War I. On October 16, 1918, President Woodrow Wilson and William Wiseman sat down for an interview. This interview was one reason why the German government accepted the Fourteen Points and the stated principles for peace negotiations. The report made as negotation points, and later the Fourteen Points was accepted by France and Italy on November 1, England later signed off on all of the points except the freedom of the seas. England also wanted Germany to make reperation payments for the war, and thought that that should be added to the Fourteen Points. 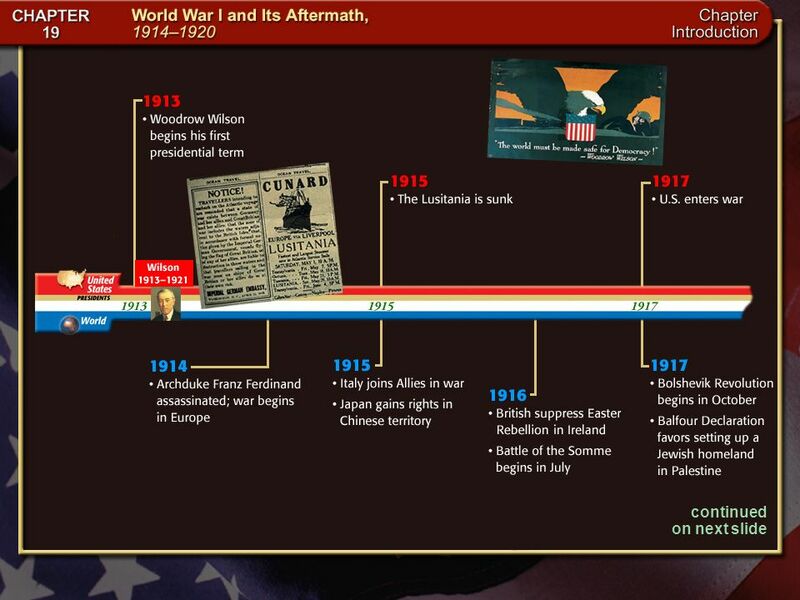 The U.S. joined the Allies in fighting the Central Powers on April 6, The Fourteen Points in the speech were based on the research of the Inquiry, a team of about 150 advisors led by foreign-policy advisor Edward M. House into the topics likely to arise in the anticipated peace conference. Wilson's speech on January 8, 1918, took many of the principles of progressivism that had produced domestic reform in the U.S. and translated them into foreign policy (free trade, open agreements, democracy and self-determination). 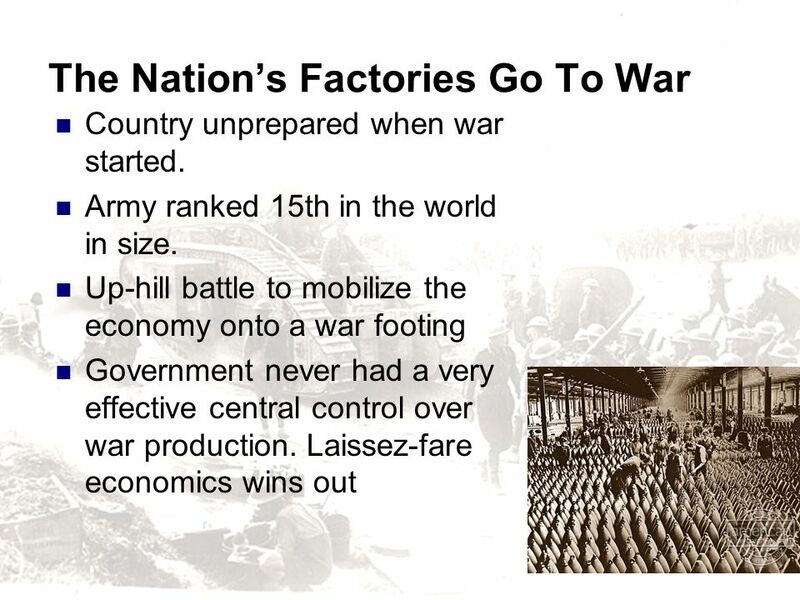 The Fourteen Points speech was the only explicit statement of war aims by any of the nations fighting in World War I. Some belligerents gave general indications of their aims, but most kept their post-war goals private. The speech also responded to Vladimir Lenin's Decree on Peace of October 1917, which proposed an immediate withdrawal of Russia from the war, calling for a just and democratic peace that was not compromised by territorial annexations, and led to the Treaty of Brest-Litovsk on March 3, 1918. 13 Enforcing Loyalty Anti-German hysteria and discrimination. German-American schools and newspapers by the thousands were forced to permanently close. In cities and towns across the nation, libraries burned their German-language books in public burnings. City streets in Chicago with German names were changed Liberty Cabbage, and Dachshunds became "liberty pups". 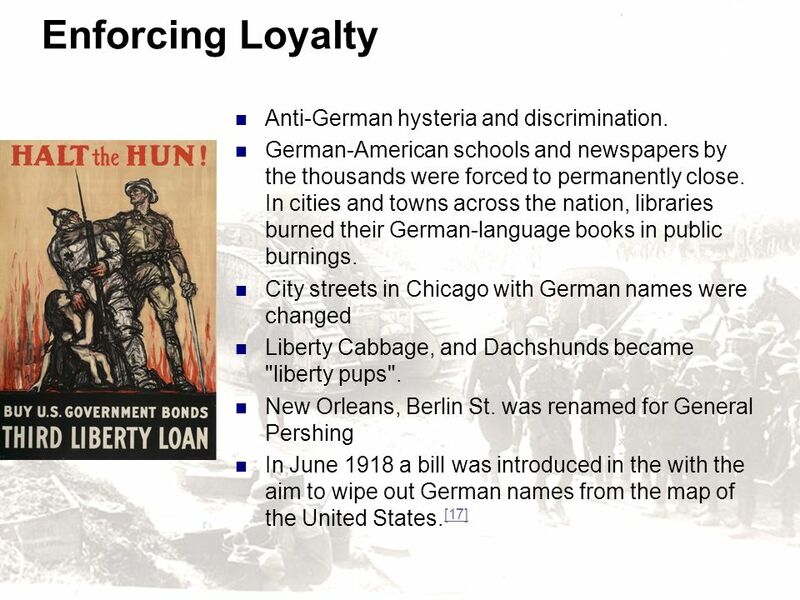 New Orleans, Berlin St. was renamed for General Pershing In June 1918 a bill was introduced in the with the aim to wipe out German names from the map of the United States. 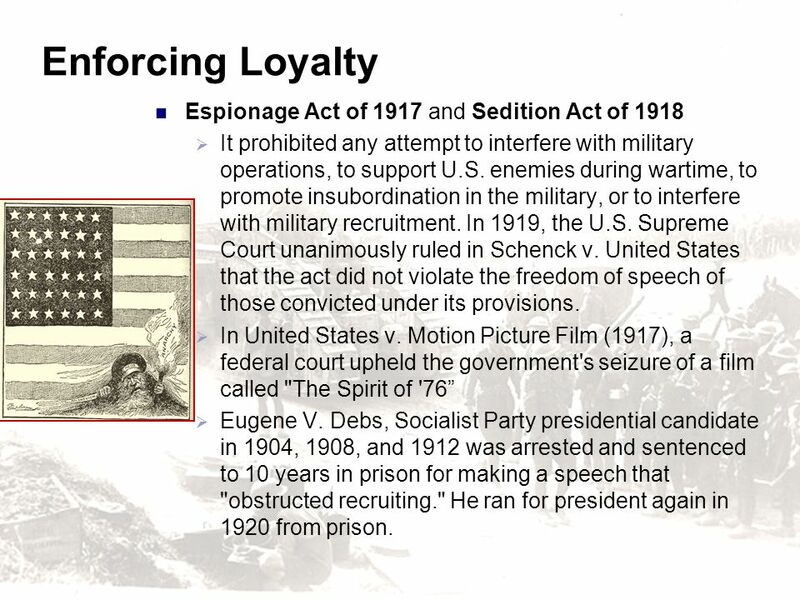 The Espionage Act of 1917, 18 USC § 792 et seq., is a United States federal law passed on June 15, 1917, shortly after the U.S. entry into World War I. It prohibited any attempt to interfere with military operations, to support U.S. enemies during wartime, to promote insubordination in the military, or to interfere with military recruitment. In 1919, the U.S. Supreme Court unanimously ruled in Schenck v. United States that the act did not violate the freedom of speech of those convicted under its provisions. 16 Labor Mostly, Feds were able to keep labor in line with a combination of strategies. Work or fight rule. National War Labor Board chaired by Former President Taft. Its purpose was to arbitrate disputes between workers and employers in order to ensure labor reliability and productivity. 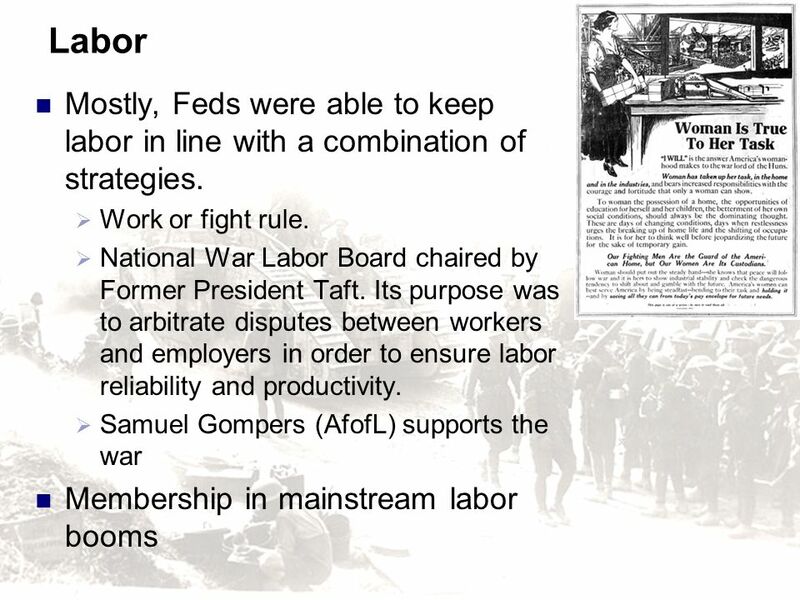 Samuel Gompers (AfofL) supports the war Membership in mainstream labor booms The National War Labor Board (NWLB) was a federal agency created in April 1918 by President Woodrow Wilson. It was composed of representatives from business and labor, and chaired by Former President William Howard Taft. Its purpose was to arbitrate disputes between workers and employers in order to ensure labor reliability and productivity during the war. It was disbanded after the war in May, 1919. Overall, the decisions of the NWLB generally supported and strengthened the position of labor. 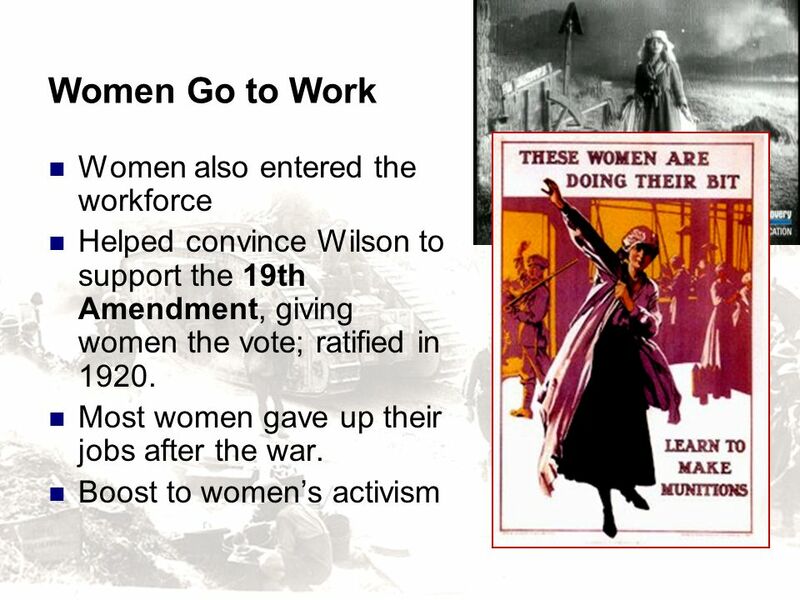 Although it opposed the disruption of war production by strikes, it supported an eight-hour day for workers, equal pay for women, and the right to organize unions and bargain collectively. 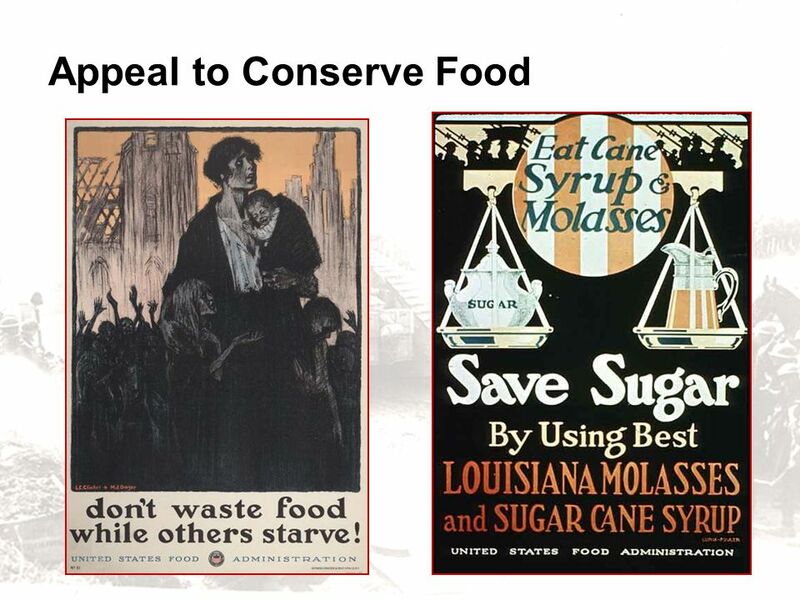 Although the NWLB did not have any coercive enforcement power, public opinion and support from President Wilson generally ensured compliance with its decisions. In general, the relative strength of organized labor in America grew substantially during the war. Union membership almost doubled after the formation of the NWLB. Of note, the AFL membership rose from 2 million in 1916 to 3.2 million in By the end of the decade, 15% of the nonagricultural work force was unionized. 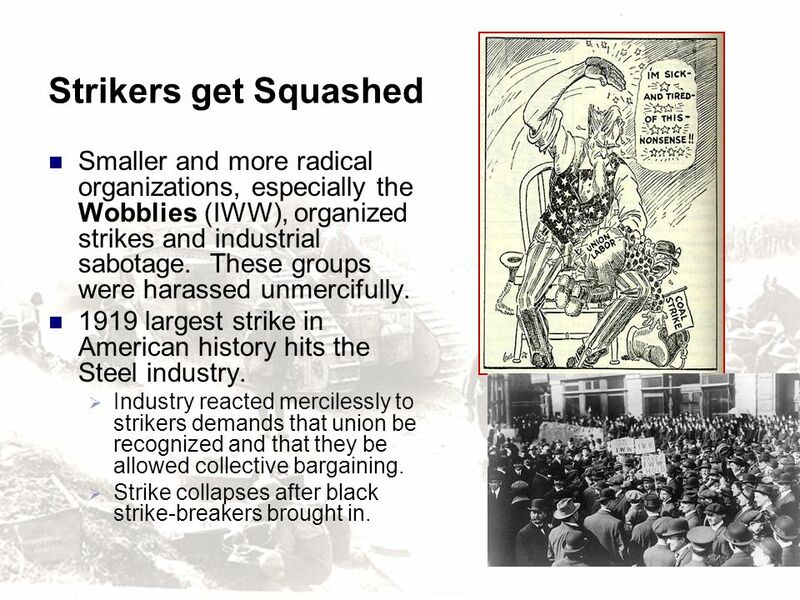 17 Strikers get Squashed Smaller and more radical organizations, especially the Wobblies (IWW), organized strikes and industrial sabotage. These groups were harassed unmercifully. 1919 largest strike in American history hits the Steel industry. Industry reacted mercilessly to strikers demands that union be recognized and that they be allowed collective bargaining. Strike collapses after black strike-breakers brought in. The Industrial Workers of the World (IWW or the Wobblies) is an international union. At its peak in 1923, the organization claimed some 100,000 members in good standing, and could marshal the support of perhaps 300,000 workers. Its membership declined dramatically after a 1924 split brought on by internal conflict. IWW membership does not require that one work in a represented workplace, nor does it exclude membership in another labor union. The IWW contends that all workers should be united as a class and that the wage system should be abolished. They may be best known for the Wobbly Shop model of workplace democracy, in which workers elect recallable delegates, and other norms of grassroots democracy (self-management) are implemented. On January 3, 2010 the IWW GHQ moved its general offices into a new location at 2117 W. Irving Park Rd., Chicago, IL. United States. The origin of the nickname "Wobblies" is uncertain. 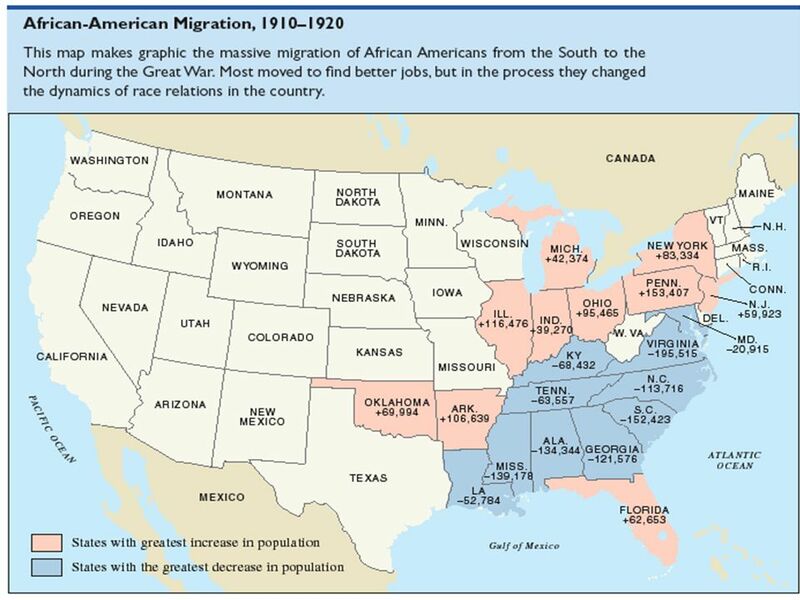 18 Black Migration War was beginning of a mass migration of blacks from the south to the industrial north. 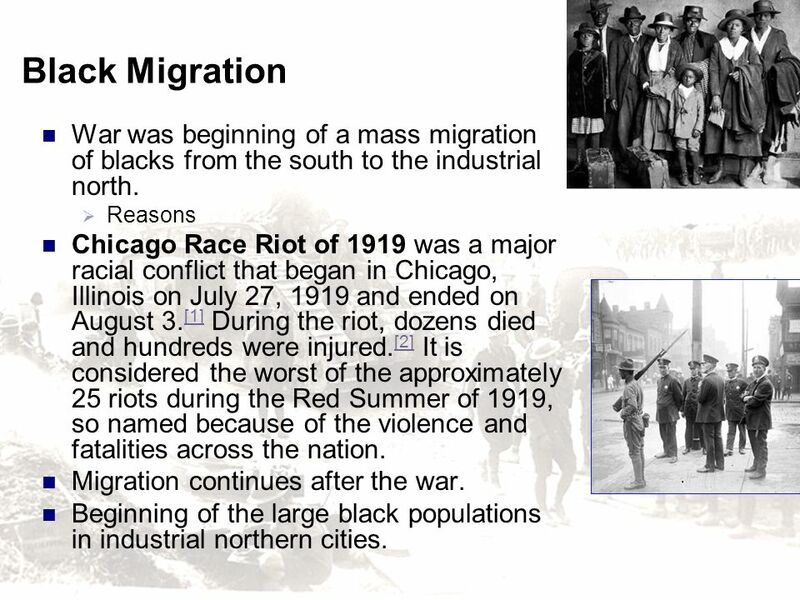 Reasons Chicago Race Riot of 1919 was a major racial conflict that began in Chicago, Illinois on July 27, 1919 and ended on August 3. During the riot, dozens died and hundreds were injured. It is considered the worst of the approximately 25 riots during the Red Summer of 1919, so named because of the violence and fatalities across the nation. Migration continues after the war. Beginning of the large black populations in industrial northern cities. The Chicago Race Riot of 1919 was a major racial conflict that began in Chicago, Illinois on July 27, 1919 and ended on August 3. During the riot, dozens died and hundreds were injured. It is considered the worst of the approximately 25 riots during the Red Summer of 1919, so named because of the violence and fatalities across the nation. The combination of prolonged arson, looting and murder was the worst race rioting in the history of Illinois. The sociopolitical atmosphere of Chicago was one of ethnic tension caused by competition among many new groups. With the Great Migration, thousands of African Americans from the South had settled next to neighborhoods of European immigrants on Chicago's South Side, near jobs in the stockyards and meatpacking plants. The ethnic Irish had been established first, and fiercely defended their territory and political power against all newcomers. Post World War I tensions caused frictions between the races, especially in the competitive labor and housing markets. Overcrowding and increased African American militancy by veterans contributed to the visible racial frictions. Also, ethnic gangs and police neglect strained the racial relationships. According to official reports, the turmoil came to a boil after a young African American was struck by a rock and died at an informally segregated beach. Tensions between groups arose in a melee that blew up into days of unrest. William Hale Thompson was the Mayor of Chicago during the riot. Although future mayor Richard J. Daley never officially acknowledged being part of the violence, at age 17 he was an active member of the ethnic Irish Hamburg Athletic Club, which a post-riot investigation named instigators in attacks on blacks. In the following decades, Daley continued to rise in politics to become mayor for twenty years. United States President Woodrow Wilson and the United States Congress attempted to promote legislation and organizations to decrease racial discord in America. Illinois Governor Frank Lowden took several actions at Thompson's request to quell the riot and promote greater harmony in its aftermath. Sections of the Chicago economy were shut down for several days during and after the riots, as plants were closed to avoid interaction among warring groups. Mayor Thompson drew on his association with this riot to influence later political elections. 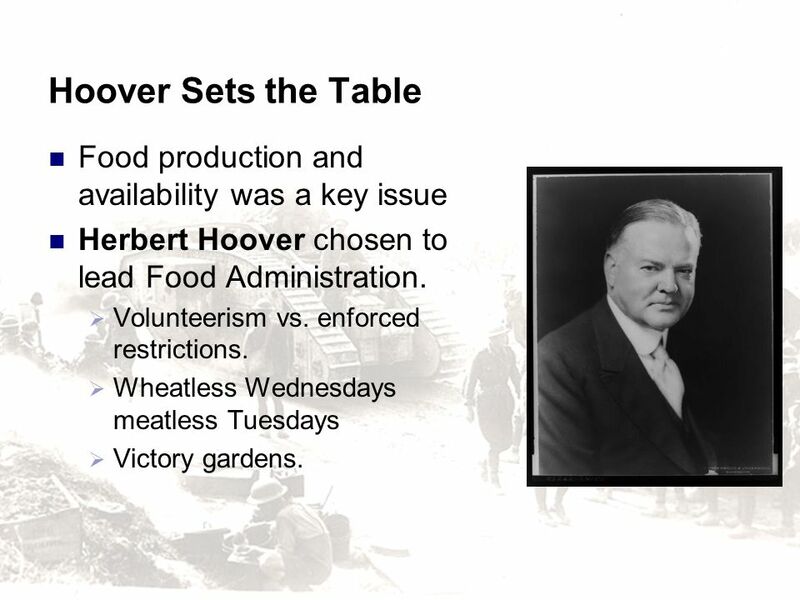 Herbert Hoover chosen to lead Food Administration. Volunteerism vs. enforced restrictions. Wheatless Wednesdays meatless Tuesdays Victory gardens. Helped advance the cause of prohibition. Many brewers were of German extraction and were subject to war-prejudices. 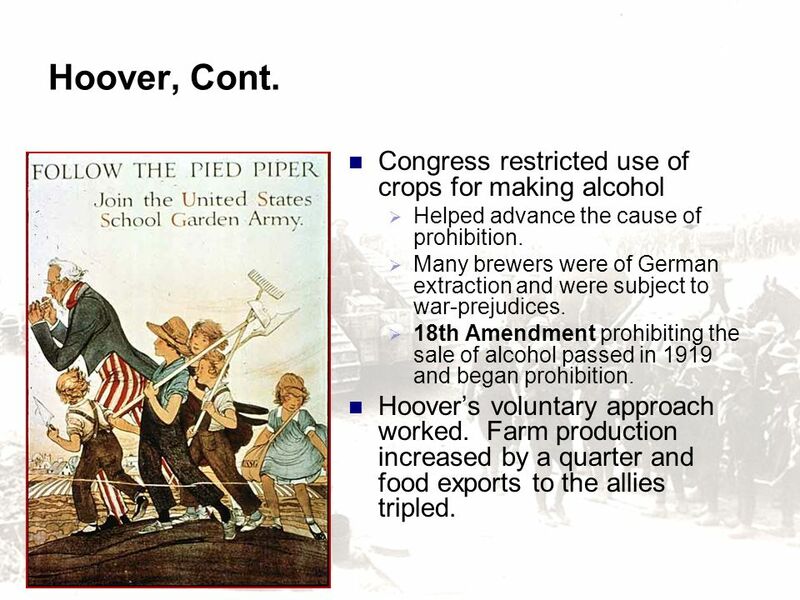 18th Amendment prohibiting the sale of alcohol passed in 1919 and began prohibition. Hoover’s voluntary approach worked. Farm production increased by a quarter and food exports to the allies tripled. Great bond drives. 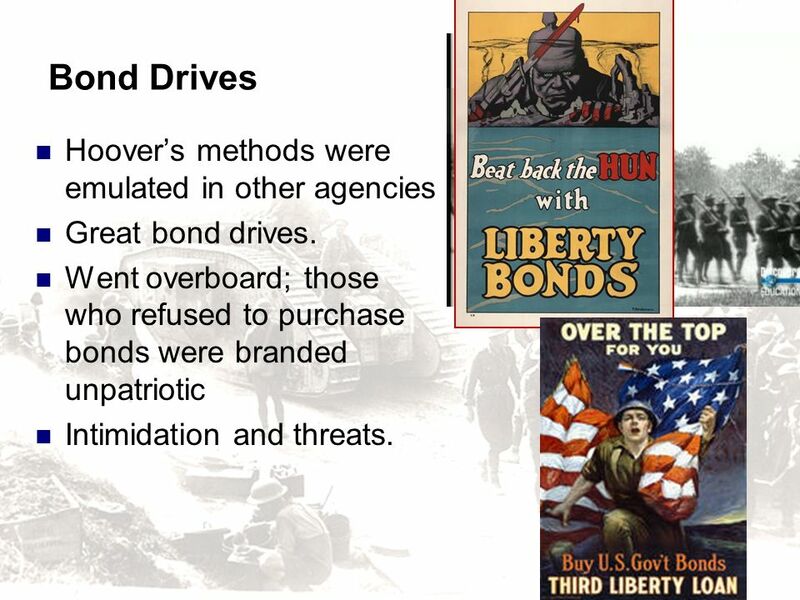 Went overboard; those who refused to purchase bonds were branded unpatriotic Intimidation and threats. At the beginning, most Americans assumed that US contribution to war would be naval Allies made it clear that they were running out of men to throw into the war. 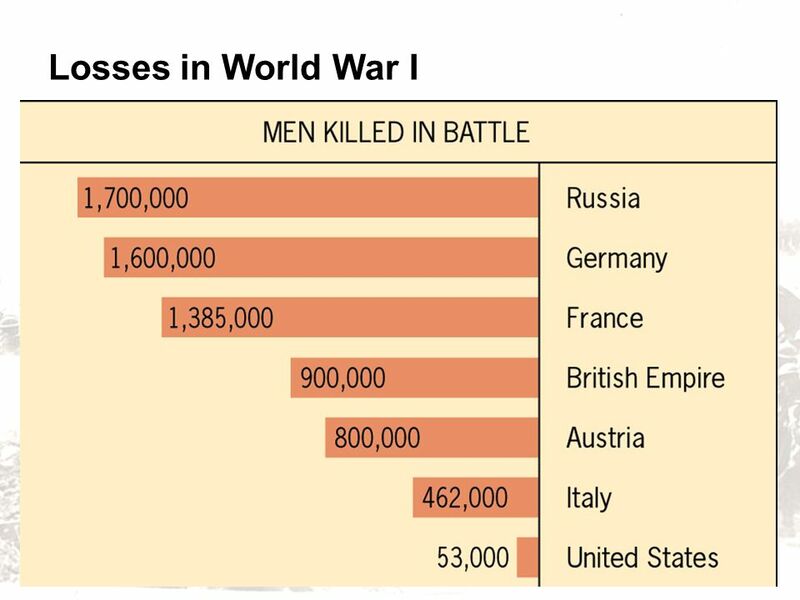 The war had been extraordinarily bloody. Allies need America to supply fresh troops. 26 Draft Many volunteered for war, but not enough. conscription. Some in congress predicted that a draft would cause riots. Compared by some to Slave labor. 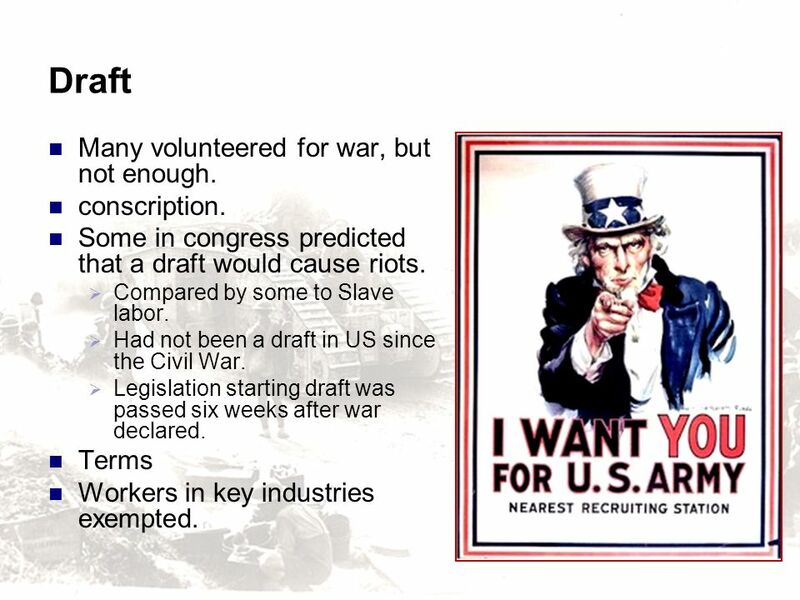 Had not been a draft in US since the Civil War. Legislation starting draft was passed six weeks after war declared. Terms Workers in key industries exempted. 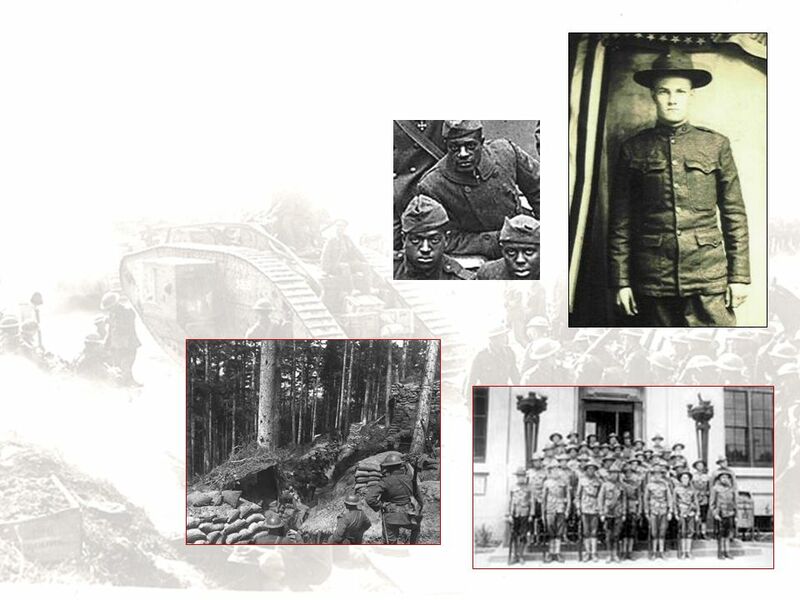 On May 18, 1917, during World War I the Selective Service Act was passed authorizing the President to increase temporarily the military armed forces by the process of selecting men for induction into the military service. In 1917 and 1918, approximately 24 million men, (98% of men present in America), born between 1873 and 1900 completed draft registration cards. The selective service boards were responsible for registering men, classifying them, taking into consideration needs for manpower in certain industries and in agriculture, as well as certain special family situations of the registrants; handling any appeals of these classifications; determining the medical fitness of individual registrants; determining the order in which registrants would be called; calling registrants; and placing them on trains to training centers. Local boards were established for each county or similar subdivision in each state, and for each 30,000 persons (approximately) in each city or county with a population over 30,000. 27 Doughboys Within a few months, army grows to over 4 Mill. How to get these guys ready to fight? Training timetable had to be accelerated. Nearly a year after US declared war before US troops in any force could fight in Europe. 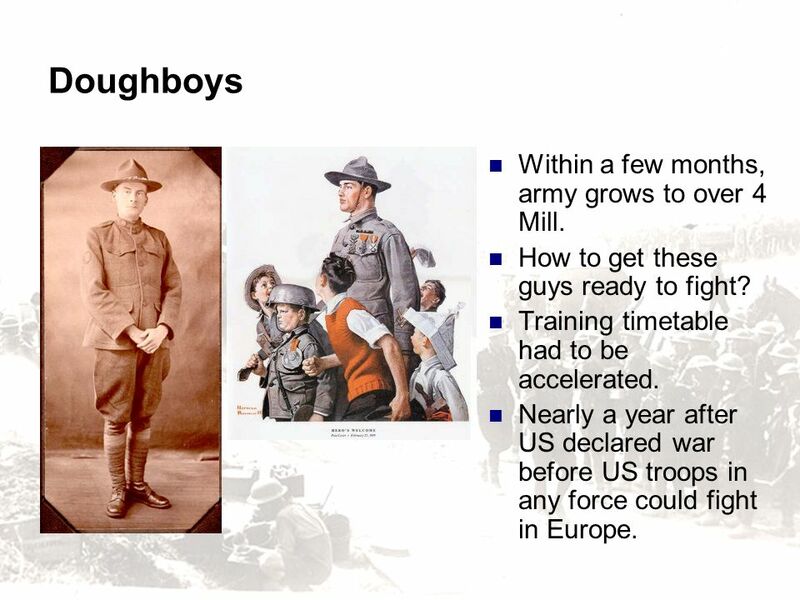 Doughboy is an outdated slang term for a United States Army infantryman, best known from its use in World War I, although it dates back to the Mexican-American War of  The origin of the term is unclear. The most often cited explanation is that it arose during the Mexican-American War, after observers noticed U.S. infantry forces were constantly covered with chalky dust from marching through the dry terrain of northern Mexico, giving the men the appearance of unbaked dough. 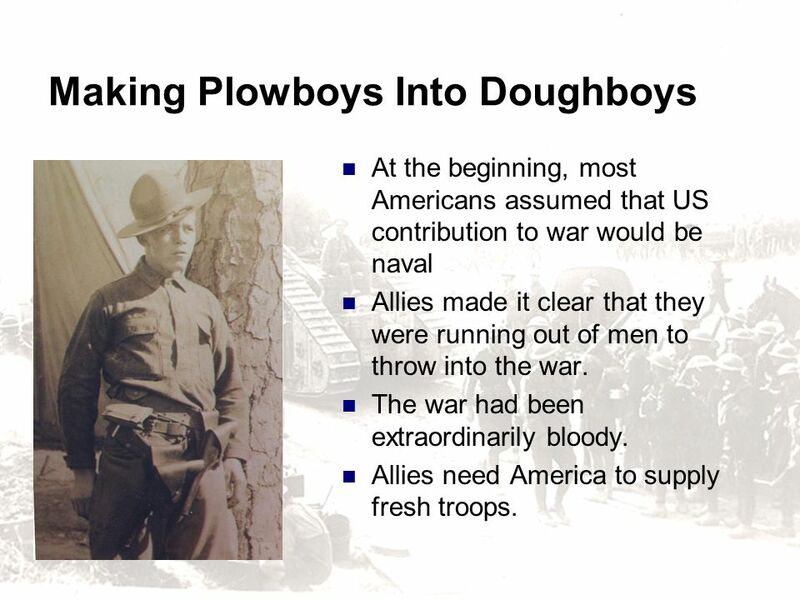 Another suggestion is that doughboys were so named because of their method of cooking field rations of the 1840s and 1850s, usually doughy flour and rice concoctions baked in the ashes of a camp fire, although this does not explain why only infantryman received the appellation. Still another explanation involves pipe clay, a substance with the appearance of dough used by pre-Civil War soldiers to clean their white garrison belts. None of these theories are provable. An American doughboy (right) receives an award from King George V.What is known with certainty is that the term doughboy - as applied to infantry soldiers of the United States Army - appears in authenticated written wartime accounts as well as postwar memoirs of the Mexican-American War of  In general usage, "doughboy" became most popular during World War I with the formation and deployment of the American Expeditionary Force (AEF) led by General John J. Pershing. U.S. Army enlisted soldiers and non-commissioned officers in the AEF frequently referred to themselves by the name, and the term was widely used in contemporary media, both in the United States and in Europe. At first, the term was applied only to U.S. infantry or foot soldiers, but soon extended to the entire American contingent, to the chagrin of the Marines. The term was used sparingly during World War II, gradually replaced by the appellations "G.I. ", "Troop", or "Dogface", but was still used in popular songs of the day, as in the 1942 song Johnny Doughboy found a Rose in Ireland. It dropped out of popular use soon after World War II. However, in the 1960s General William Westmoreland started what was called Recondo, a training course that took its name from "reconnaissance" and "doughboy". 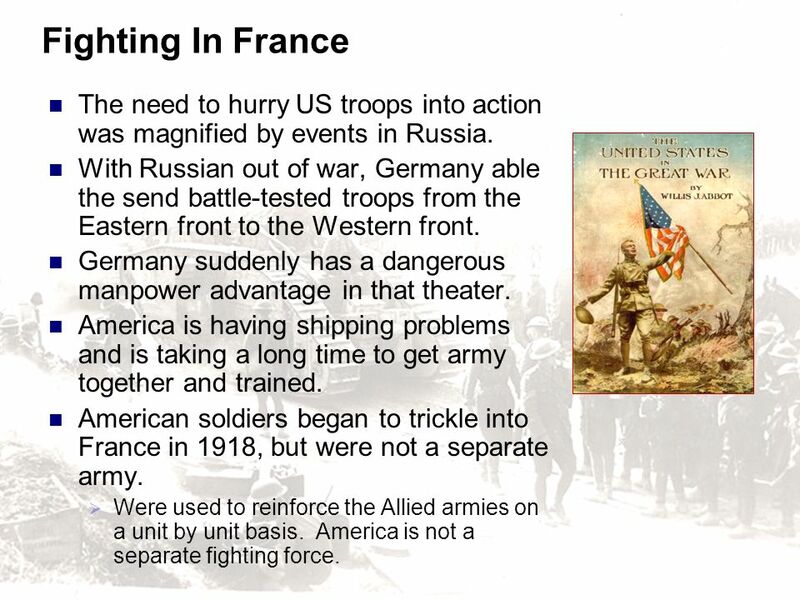 29 Fighting In France The need to hurry US troops into action was magnified by events in Russia. With Russian out of war, Germany able the send battle-tested troops from the Eastern front to the Western front. Germany suddenly has a dangerous manpower advantage in that theater. America is having shipping problems and is taking a long time to get army together and trained. 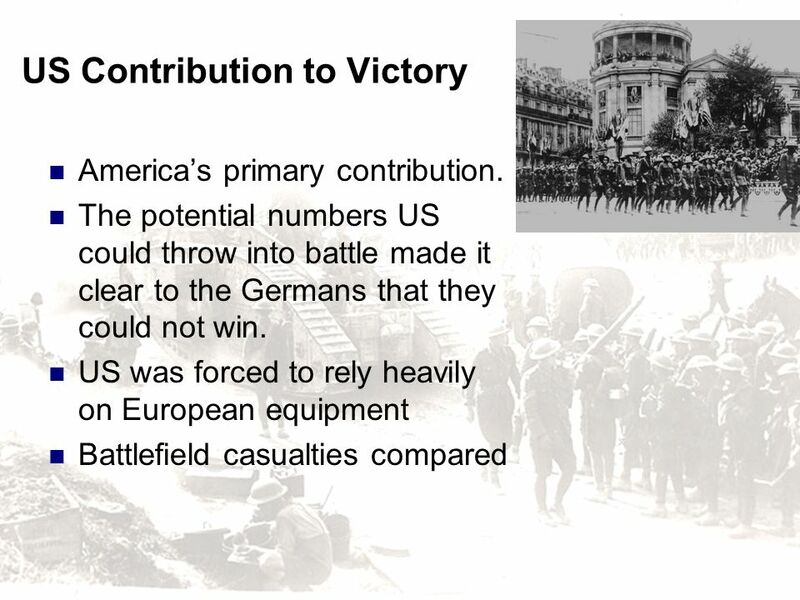 American soldiers began to trickle into France in 1918, but were not a separate army. Were used to reinforce the Allied armies on a unit by unit basis. America is not a separate fighting force. 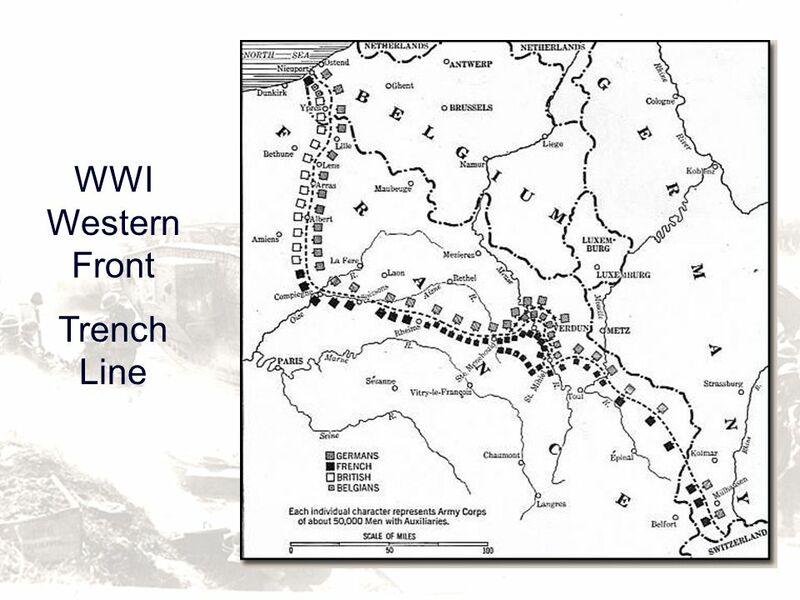 Spring 1918 the Germans unleash a massive offensive that rolled the Allies back with frightening momentum. May 1918 Germans within 40 miles of Paris US troops see their first real action as an independent unit at Chateau-Thierry. 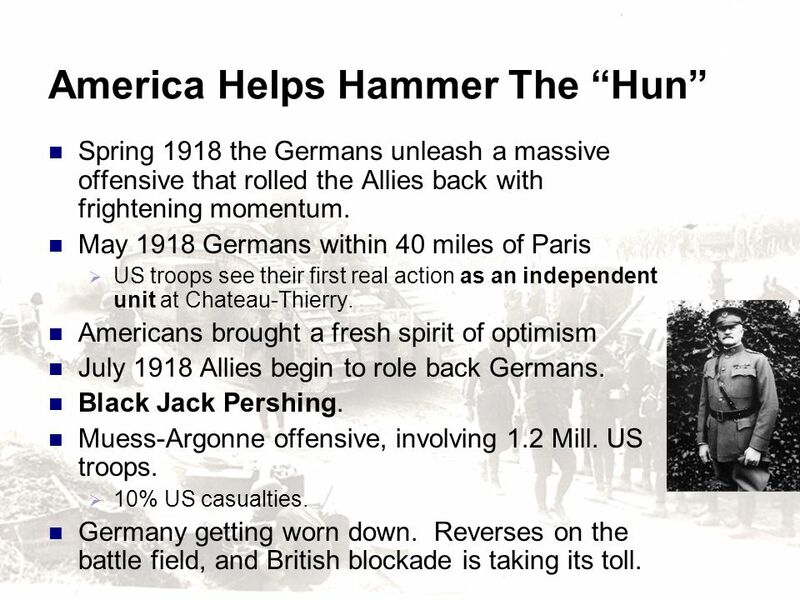 Americans brought a fresh spirit of optimism July 1918 Allies begin to role back Germans. Black Jack Pershing. Muess-Argonne offensive, involving 1.2 Mill. US troops. 10% US casualties. Germany getting worn down. Reverses on the battle field, and British blockade is taking its toll. 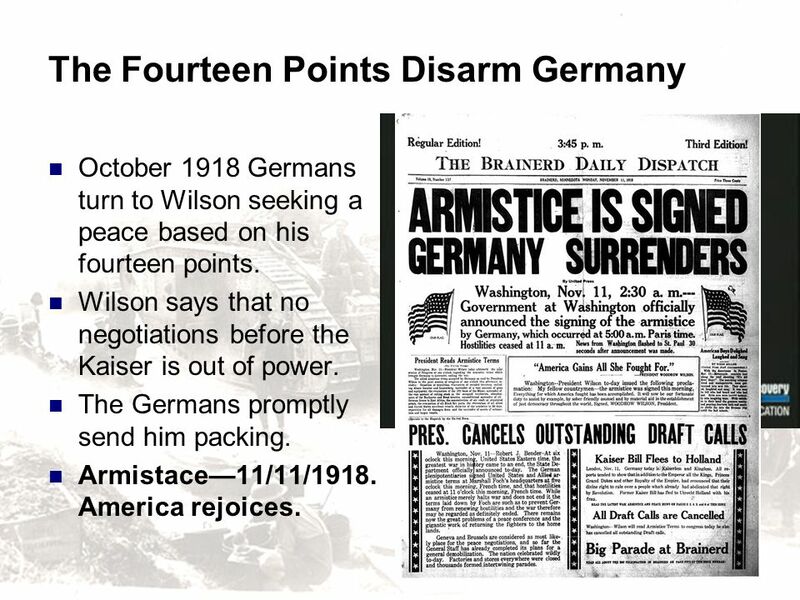 October 1918 Germans turn to Wilson seeking a peace based on his fourteen points. 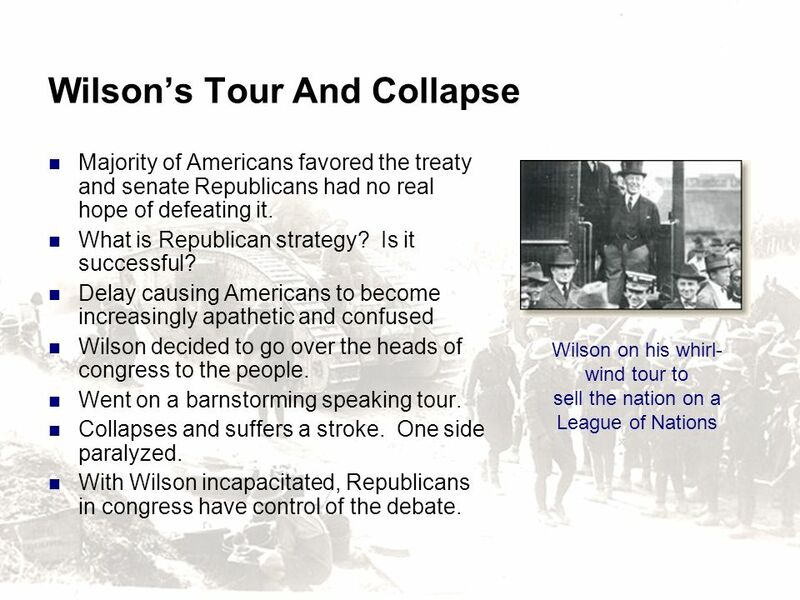 Wilson says that no negotiations before the Kaiser is out of power. The Germans promptly send him packing. Armistace—11/11/ America rejoices. At the end of the war Wilson was extraordinarily popular both at home and in Europe. Moral leader of the world with most powerful economy behind him. That popularity was not destined to last. 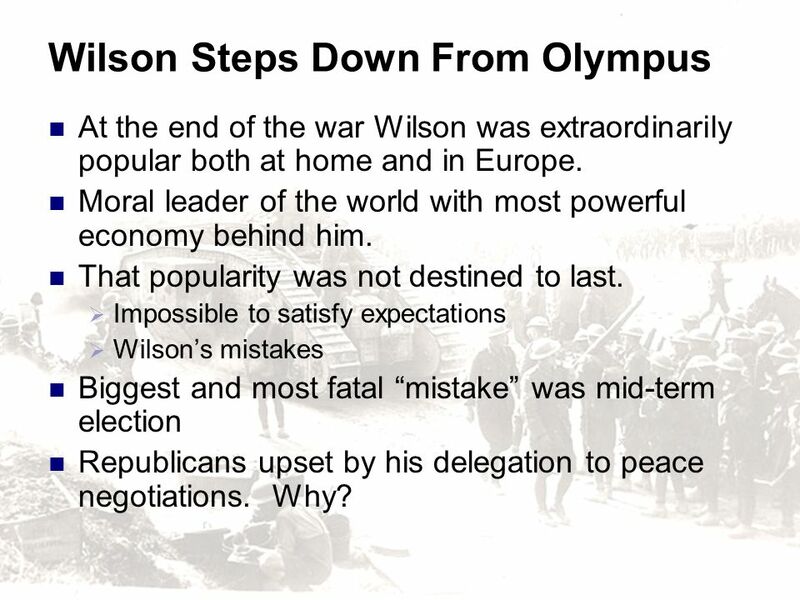 Impossible to satisfy expectations Wilson’s mistakes Biggest and most fatal “mistake” was mid-term election Republicans upset by his delegation to peace negotiations. Why? 36 Wilson’s Goal Europe was a mess. 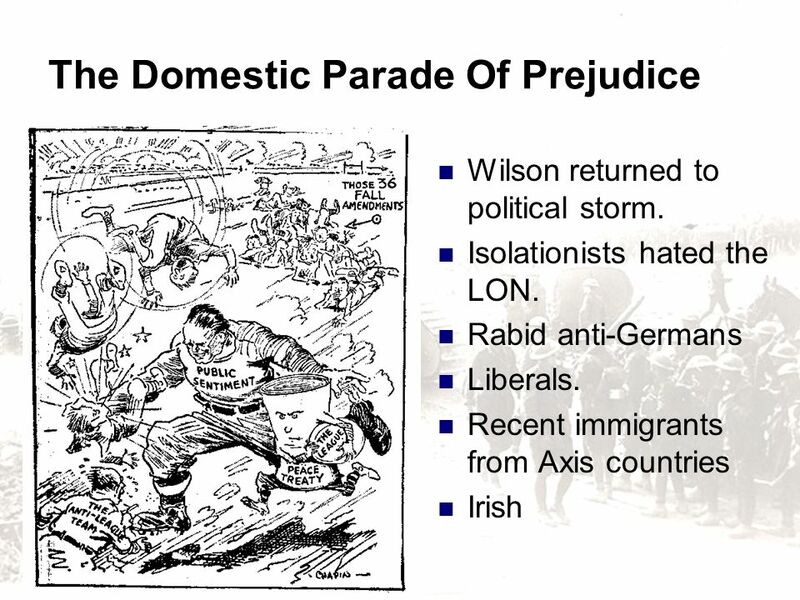 Wilson’s ultimate goal was League of Nations First priority to keep the winners from dividing up the colonies of the beaten countries. Wilson had to compromise. What did the treaty say regarding Colonies? "The Rabbit. 'My offensive equipment being practically nil, it remains for me to fascinate him with the power of my eye.'" 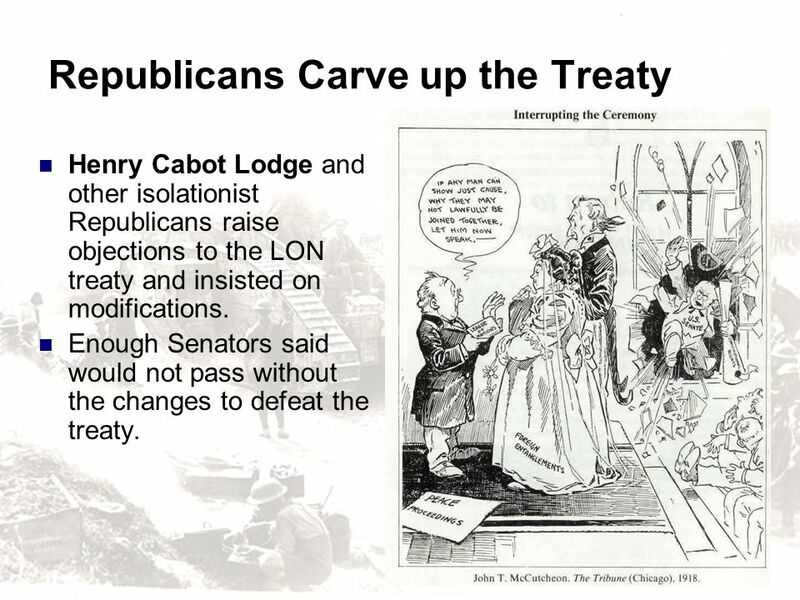 Henry Cabot Lodge and other isolationist Republicans raise objections to the LON treaty and insisted on modifications. Enough Senators said would not pass without the changes to defeat the treaty. As chairman of the Senate Foreign Relations Committee, Lodge led the successful fight against American participation in the League of Nations, which had been proposed by President Woodrow Wilson at the close of World War I. He also served as chairman of the Senate Republican Conference from 1918 to During his term in office, he and another powerful senator, Albert J. Beveridge, pushed for the construction of a new navy. Lodge maintained that membership in the world peacekeeping organization would threaten the political freedom of the United States by binding the nation to international commitments it would not or could not keep. Lodge did not, however, object to the United States interfering in other nation's affairs, and was in actuality a proponent of imperialism (see Lodge Committee for further explanation). In fact, Lodge's key objection to the League of Nations was Article X, the provision of the League of Nations charter that required all signatory nations to make efforts to repel aggression of any kind. Lodge perceived an open-ended commitment to deploy soldiers into conflict regardless of it being relevant to the national security interests of the United States. He did not want America to have this obligation. 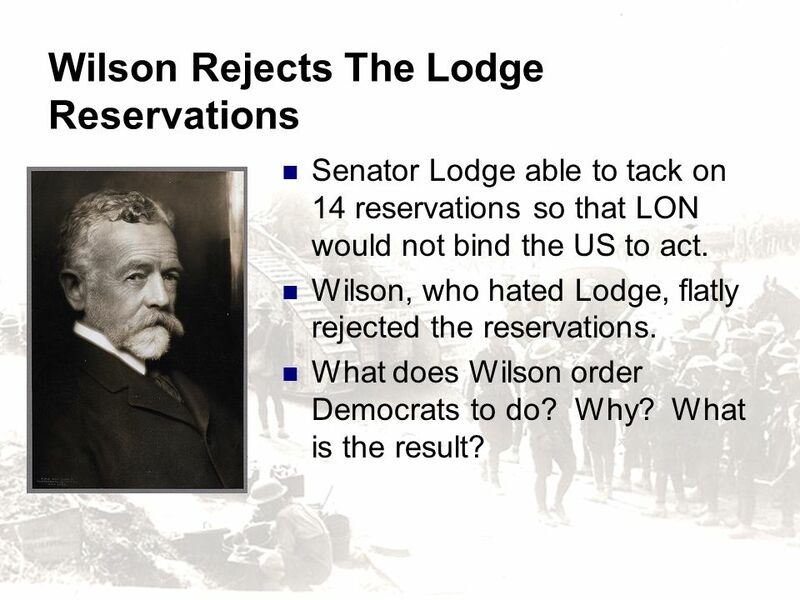 Lodge was also motivated by political concerns; he strongly disliked Woodrow Wilson and was eager to find an issue for the Republican Party to run on in 1920. Senator Lodge argued in  against the League: The United States is the world's best hope, but if you fetter her in the interests and quarrels of other nations, if you tangle her in the intrigues of Europe, you will destroy her powerful good, and endanger her very existence. Leave her to march freely through the centuries to come, as in the years that have gone. Strong, generous, and confident, she has nobly served mankind. Beware how you trifle with your marvelous inheritance; this great land of ordered liberty. For if we stumble and fall, freedom and civilization everywhere will go down in ruin. Lodge appealed to the patriotism of American citizens by objecting to what he saw as the erosion of national sovereignty: "I have loved but one flag and I can not share that devotion and give affection to the mongrel banner invented for a league." The League of Nations was established without U.S. participation in With headquarters in Geneva, Switzerland, it remained active until World War II. After the war, it was replaced by the United Nations, which assumed many of the League's procedures and peacekeeping functions, although Article X of the League of Nations was notably absent from the UN mandate. Wilson forced into a series of compromises Treaty presented to Germans in June, They cried foul. Why? Planted seeds of resentment. 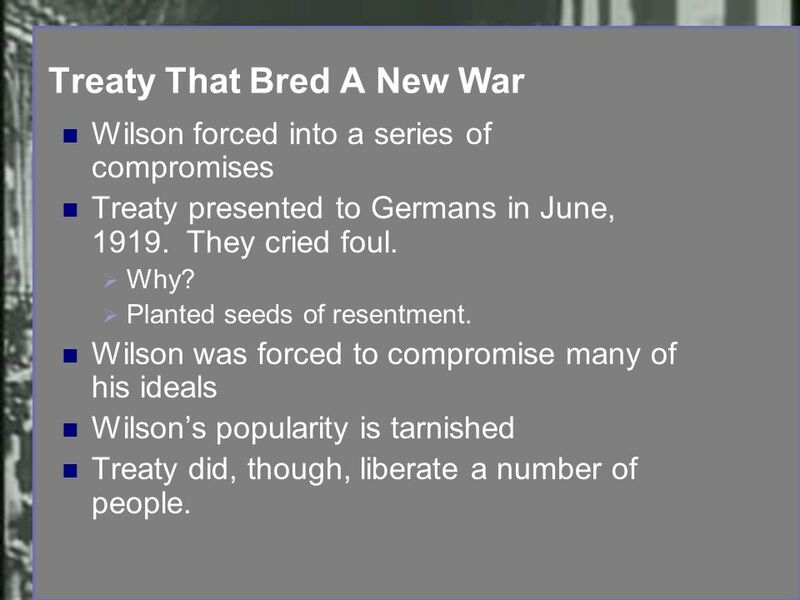 Wilson was forced to compromise many of his ideals Wilson’s popularity is tarnished Treaty did, though, liberate a number of people. Wilson returned to political storm. Isolationists hated the LON. Rabid anti-Germans Liberals. Recent immigrants from Axis countries Irish League of Nations President Wilson saw at the center of a new international order, a League of Nations. As soon as he returned home from the Versailles Peace Conference, he launched upon a cross-country tour to promote the Treaty and U.S. membership in the League. He told Americans, "At the front of this great treaty is put the Covenant of the League of Nations. It will also be at the front of the Austrian, treaty and the Hungarian treaty and the Bulgarian treaty and the treaty with Turkey. Every one of them will contain the Covenant of the League of Nations, because you cannot work any of them without the Covenant of the League of Nations. Unless you get the united, concerted purpose and power of the great Governments of the world behind this settlement, it will fall down like a house of cards. There is only one power to put behind the liberation of mankind, and that is the power of mankind. It is the power of the united moral forces of the world, and in the Covenant of the League of Nations the moral forces of the world are mobilized." [Wilson] Wilson Proposes the League President Wilson after submitting a Draft Covenant for a League of Nations on February 14, 1919, left Paris on February 15, returning to the United States. He sought to promote the League which he saw as the central feature of the Versailles Peace Treaty and a "world made safe for democracy" without the scourge of war. 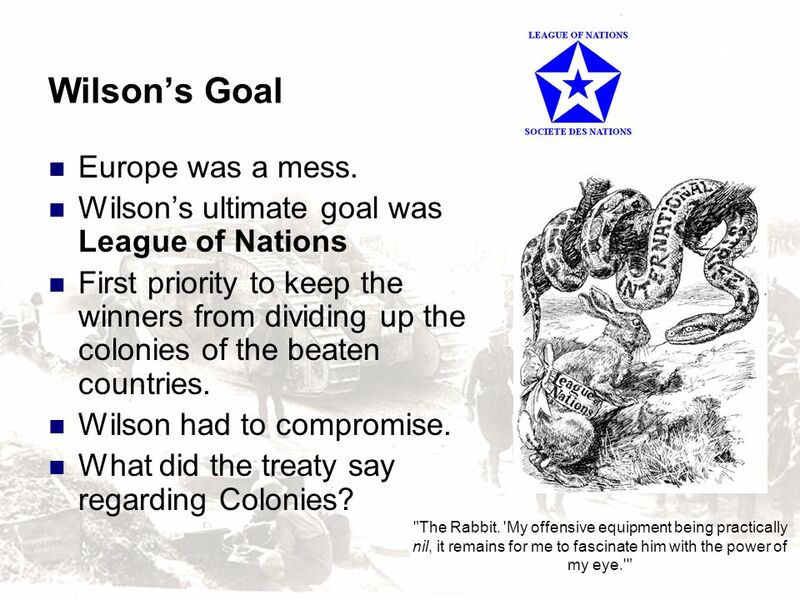 In the World War I peace settlement, Wilson compromised many of his principles to get the support of the Allies (Britain, France, and Italy) fo what he saw as the cornerstone of the new world order--the League of Nation. [Chace] Upon arriving in Boston on February 15, he gives his first speech promoting the League. Public pressure forced another vote. 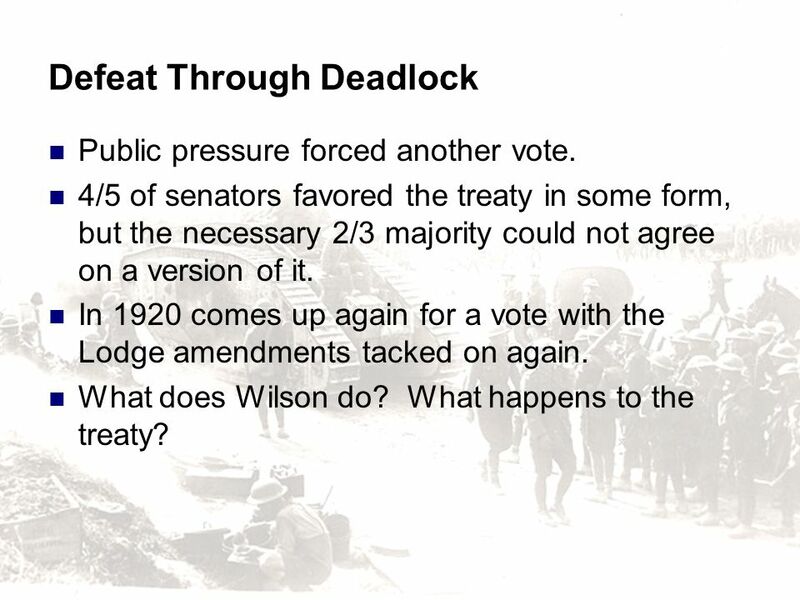 4/5 of senators favored the treaty in some form, but the necessary 2/3 majority could not agree on a version of it. In 1920 comes up again for a vote with the Lodge amendments tacked on again. What does Wilson do? What happens to the treaty? 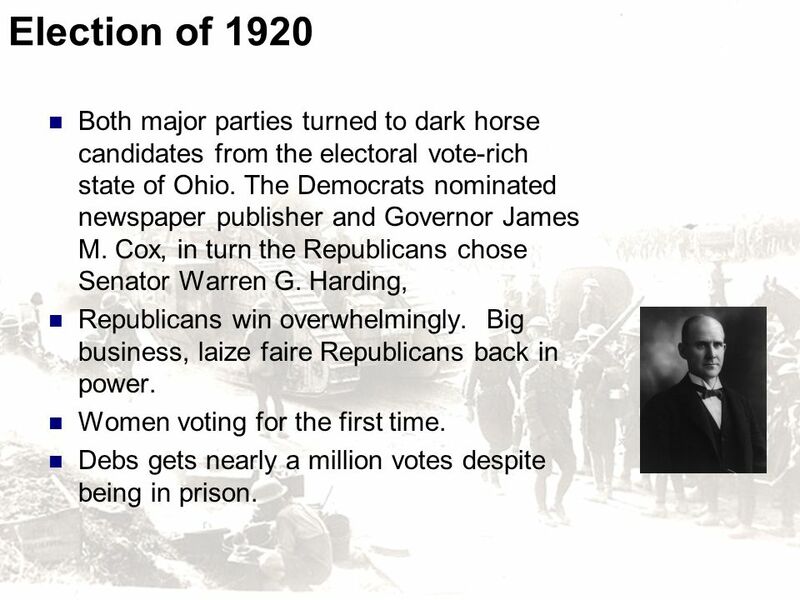 45 Election of 1920 Both major parties turned to dark horse candidates from the electoral vote-rich state of Ohio. 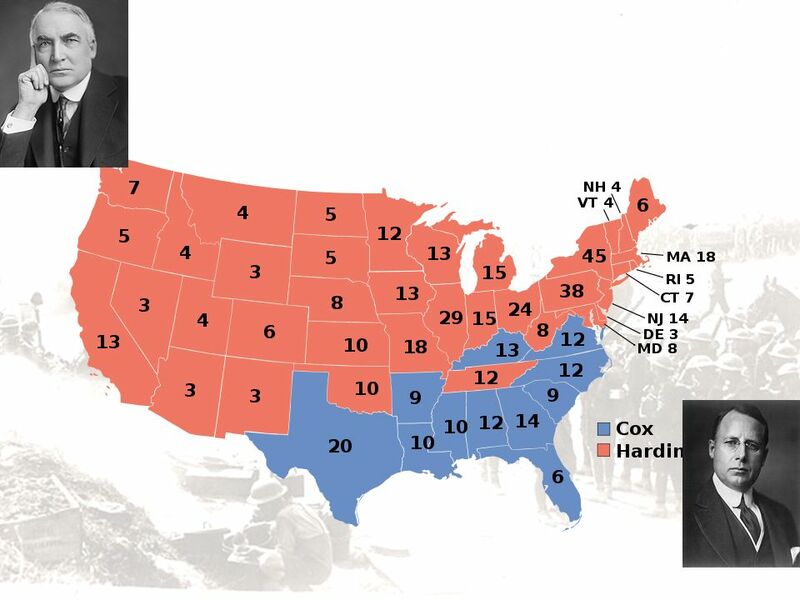 The Democrats nominated newspaper publisher and Governor James M. Cox, in turn the Republicans chose Senator Warren G. Harding, Republicans win overwhelmingly. Big business, laize faire Republicans back in power. Women voting for the first time. Debs gets nearly a million votes despite being in prison. 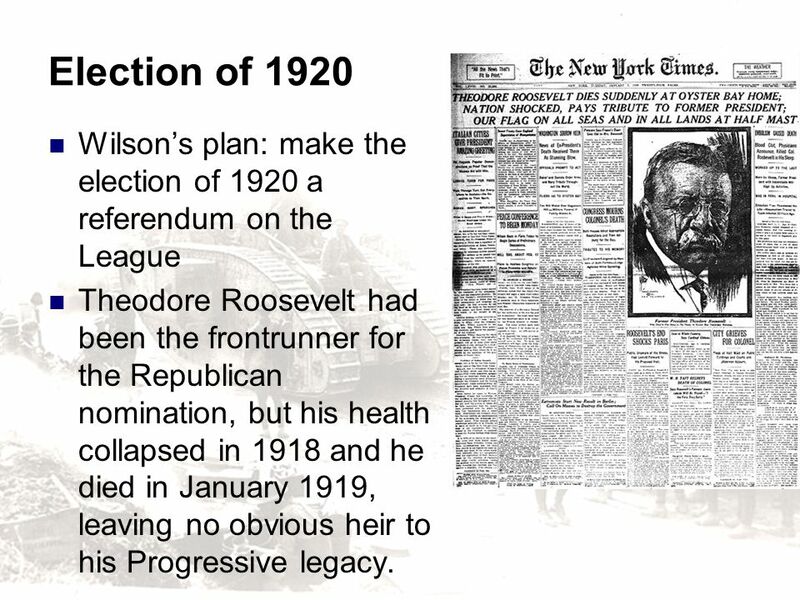 The United States presidential election of 1920 was dominated by the aftermath of World War I and the hostile reaction to Woodrow Wilson, the Democratic president. The wartime boom had collapsed. Politicians were arguing over peace treaties and the question of America's entry into the League of Nations. Overseas there were wars and revolutions; at home, 1919 was marked by major strikes in meatpacking and steel, and large race riots in Chicago and other cities. Terrorist attacks on Wall Street produced fears of radicals and terrorists. Outgoing President Wilson was increasingly unpopular, and following his severe stroke in 1919 could no longer speak on his own behalf. The economy was in a recession, the public was weary of war and reform, the Irish Catholic and German communities were outraged at his policies, and his sponsorship of the League of Nations produced an isolationist reaction. Former President Theodore Roosevelt had been the frontrunner for the Republican nomination, but his health had collapsed in 1918 and he died in January 1919, leaving no obvious heir to his Progressive legacy. James M. Cox launched an energetic campaign against Senator Harding, but he did all he could to defeat him, but he lost badly. To help his camapign, he chose future President, Franklin D. Roosevelt as his running mate. The electoral college didn't vote for Roosevelt as Vice President, but the national popular vote showed that he had won the popular vote for President in 1932, 1936, 1940 and in He defeated Herbert Hoover, Alf Landon, Wendell Willkie and Thomas E. Dewey. All four were Republicans. LON left without the vital American international support America retreated behind isolationism and let Europe find its own way. France feels compelled to rearm, so Germany does, too. 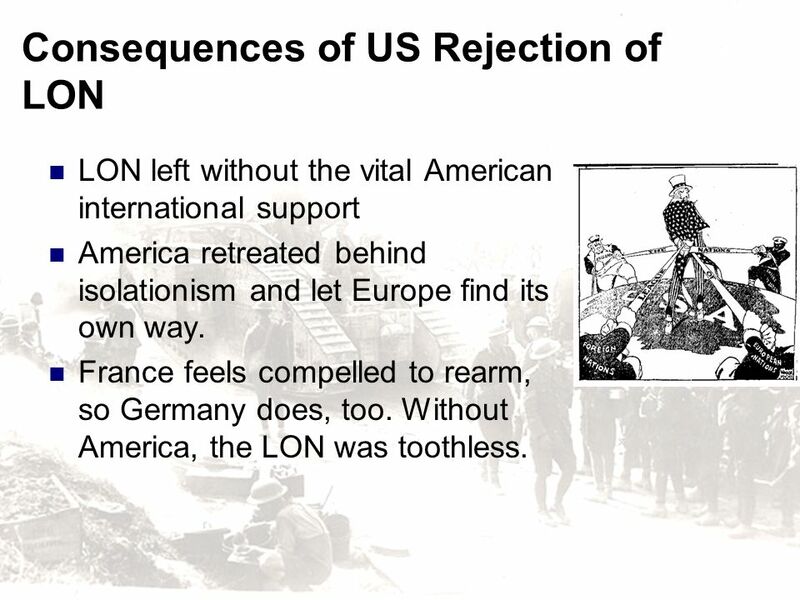 Without America, the LON was toothless. 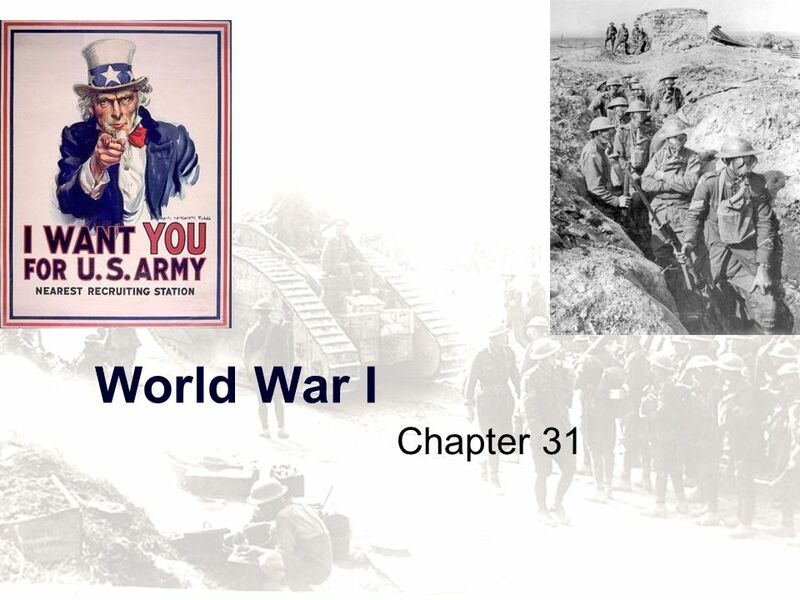 Download ppt "World War I Chapter 31." 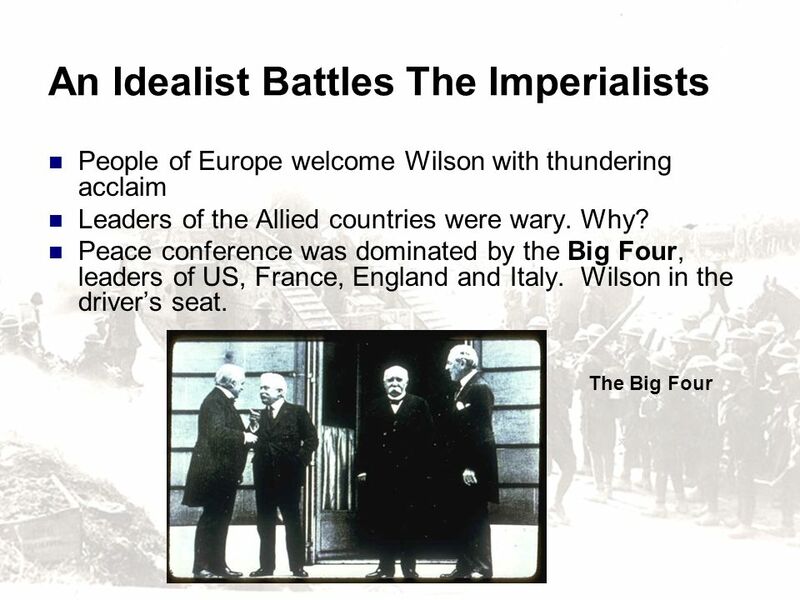 Imperialism and WWI Wilson’s Peace Plan. Baltimore Polytechnic Institute March 8, 2013 A/A.P. U.S. History Mr. Green. TEKS 8C: Calculate percent composition and empirical and molecular formulas. 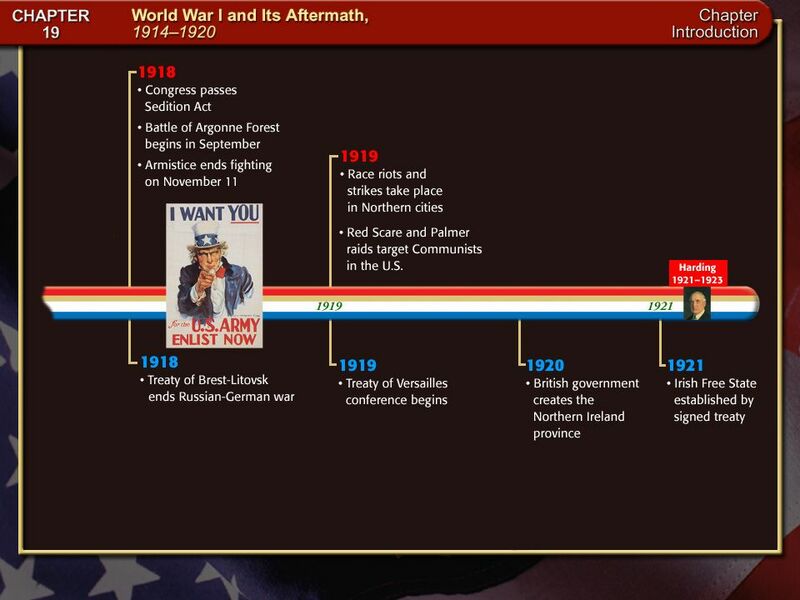 American Involvement in World War I. Chapter 37 Over Here: World War I at Home 1917–1920. 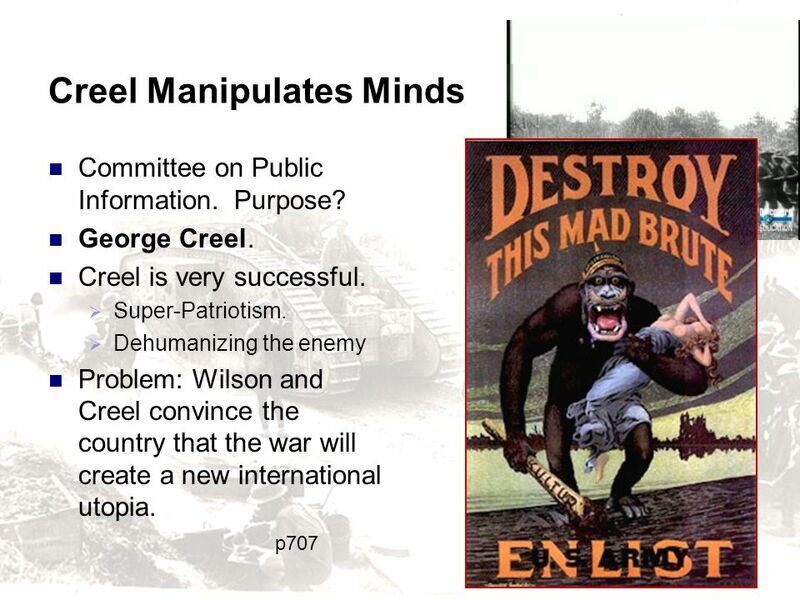 U.S. Enters War - ________________ name of Wilson’s Plan in World War One -why??? And is it REASONABLE??? -U-boat, Submarine warfare continues -Zimmerman. 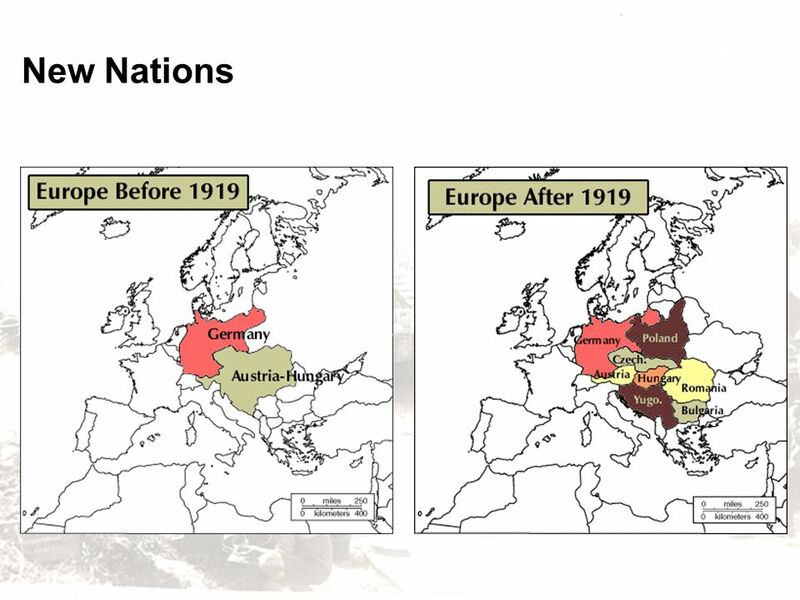 UNIT 6: IMPERIALISM & WORLD WAR I (1890 – 1918) A Troubling Treaty! American Involvement in World War I. convoy – group of ships that traveled together for protection against German U-boats Vladimir Lenin – radical communist. Chapter 30: The War to End War War by Act of Germany What did the Midwestern senators filibuster in relation to arming ships reflect? What. World War I Chapter 30. 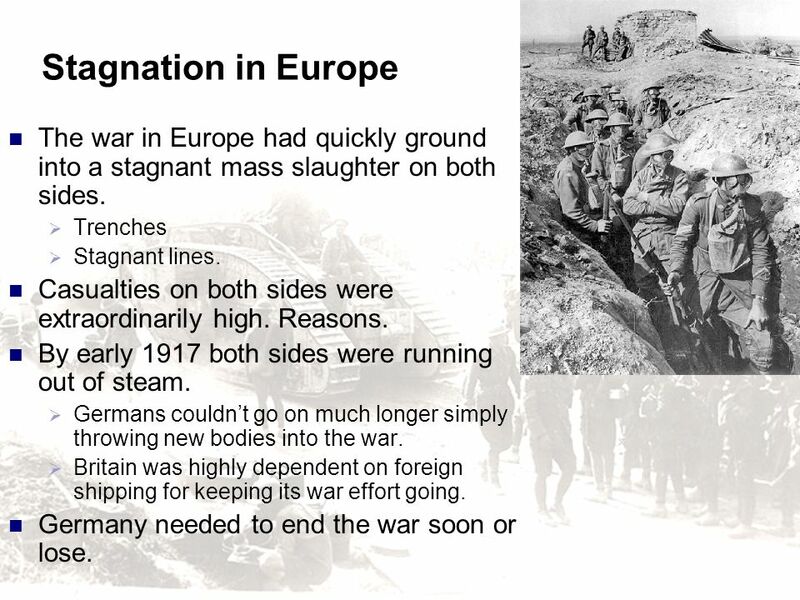 Stagnation in Europe The war in Europe had quickly ground into a stagnant mass slaughter on both sides.  Trenches  Stagnant.